r. Runhild Röder (Roeder) is an evolutionist. She is a world-renowned academic philosopher and a formidable avant-garde Cobra Expressionist artist. She is the director and owner of Galerie Être in Montreal, Quebec, Canada. Röder's works speak for themselves. Her images are not drawn from a superficial point of view. Nor does she merely follow academic road signs to fit herself into representations that bespeak prejudices that have taken us to art rackets. We fail to draw a better understanding of ourselves and our world. She is politically, socially aware of norms and important trends and loopholes in East and West. Seeing Roeder's portraits, Arnulf Rainer hailed her as an accomplished artist when he taught at the Vienna Art Academy, letting her supervise his own students. She was no less appreciated at Antwerp's Royal Academy of Fine Arts and by the famous Belgian curator Jan Hoet at SMAK, Ghent's Municipal Museum of Contemporary Art. Having studied with a Chinese teacher, she appears to have the agility in her brush strokes to paint strong figurative and abstract works to lead us to a world where the beauty of a strong and intelligent woman becomes undeniably visible and is appealing to a nuanced eye. She is especially noted for her profound illuminations, in her black-and-white images especially. which have architectural archeological underpinnings, not failing to depict her idea of reality. which includes negative and positive in a surrealistic dance. Her exhibitions and collections are to be seen and found in collectors' homes and galleries in Vienna, Brussels, Leuven, Antwerp, Ghent, London, Montreal, Budapest and New Delhi. Henry Lehman, art critic for The Gazette (Montreal), compared her work to that of Appel and Alechinsky, stating that it "exceeds the astuteness of that of Betty Goodwin." Runhild Roeder's two suites of contemporary improvisations for electronic keyboard, Transcendental Odyssey and Music of the Spheres, are featured in two documentaries being made about her. Plans are under development to release them for purchase by the general public as CD albums or downloadable audio files. Inquiries are welcome in the meantime. 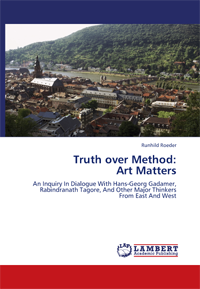 Read the book by Runhild Roeder: Truth Over Method: Art Matters now available on Amazon.com and Amazon.ca. We have seen frenzy about systems but for Roeder as with Gadamer, Heidegger and Tagore, art enlightens us most profoundly. Following Hans-Georg Gadamer (1900-2002), a leading thinker of the phenomenological tradition in continental philosophy, Runhild Roeder reclaims the ontological ground of truth in philosophy and the humanities from scientific reductionism. She sees art as closer to comprehensive truth than science, as it enables a fluid experience of self as inner dialogue, moving along with interpretation. Like it, hermeneutics eschews Enlightenment claims to "neutral" objectivity in favour of understanding as cultivated consciousness, open in all directions at once. Art shows the way beyond the methodological application of universals, taking seriously the particular case at hand and unafraid of exploring the play of truth and the truth of play. Acknowledging for the first time Gadamer's debt to Sir Rabindranath Tagore for this insight, this study painstakingly walks the reader through his critique of Greek and German Idealism, as he vindicates humanist Bildung against the hegemony of epistemology in philosophy, the humanities and culture. Truth happens in hermeneutic interpretation as in art: in the rapture of creative consciousness, when the dancer can no longer be told apart from the dance. Et mon art? Et ma philosophie? ... From the outset, Runhild Roeder's life project was spread equally between art and philosophy, and she carried it so far that she ended up coming back, by myriad winding ways through three continents, to the very spot where it was hatched some thirty years ago. Roeder then ran two art galleries on the Golden Square Mile, one of which was expropriated to make way for a new wing of the Montreal Museum of Fine Arts, that now also houses the optician's shop where her retrospective was held!